Please click on a question below to see the corresponding answer. Click the link again to collapse it. What are the Pancake Wheel Products? They are the world’s thinnest, fold-flat wagons, carts, wheelbarrows, and fun cars. Our products use a unique pancake pivoting wheel assembly. Why choose Pancake Wheel Products? Today’s consumers are space conscious and want compact, collapsible, versatile products that can stow out of the way at home or in a vehicle. No other wagon, cart, or ride-on toy can collapse to the thin profile of Pancake Wheel products. Do Pancake Wheel Products have detaching parts? No. Our wagons, carts, and kids cars were design to have no detaching parts. Are all the products I see on the site currently available? Products shown are either currently for sale or will be in the near future. If you have questions about a specific product, please email us. Are the Pancake Wheel Product designs protected? Yes. The pivoting wheel assembly is state of the art. No prior wheeled products use this type of assembly. Many of our associated designs are also protected. Are Pancake Wheel Products easy to set-up and fold-up? As you can see on our Articles page, set-up and fold-up is easy with Pancake Wheel products. It takes just seconds! 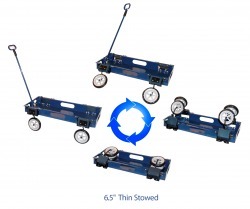 How do Pancake Wheel folding wagons/carts compare with other wagons/carts on the market? Many consumers have contacted us, asking us how our fold flat, compact wagons and carts compare to other carts and wagon products on the market. This comparison and contrast FAQ section is designed to assist consumers in making decisions about our wagon/cart products compared to competitive products. How do Pancake Wheel wagons/carts compare to convertible hand-truck products? To fold up the actual wheels on any of our products, you simply press up on the wheel assembly case to release the tire of the Pancake Wheel cart or wagon. A hidden spring then pivots the wheel inside the wagon or cart. To see the Pancake Wheel products in action, go to our Articles page and click the links for set-up and fold-up videos on YouTube. Pancake Wheel wagons and carts have a base which is horizontal to the ground, making hauling cargo easier than with other vertical hand-truck products. Instead of needing bungee cords or other tie-down devices, with a Pancake Wheel wagon or cart, your cargo stays put for easy transport and the wagon/cart folds flat for storage. How do Pancake Wheel folding wagons/carts compare to flatbed trolleys or carts? How does the Pancake Wheel fold flat wagon compare to traditional plastic/metal wagons? Radio Flyer, Little Tikes, Kettler, Safety first, and other wagon distributors generally offer a wagon with a standard non-folding wheel or tire. What’s the problem with these standard "little red wagon”? Well, it depends on what you plan to use it to do. This old reliable product in either plastic or metal has withstood the test of time—it certainly works and transports cargo well. The problem is that the standard red wagon won't fit in most small car trunks as no key parts fold or stow – not even the handle. (Try stacking two red wagons, for example.) The Pancake Wheel technology, with its compact, folding wagon and cart products give you all the cargo transport benefits of a traditional wagon or cart, with the added benefit of easy storage. Pancake Wheel: read our blog on the best, fold up, compact travel carts, wagons, joggers and more! The world’s thinnest folding solid base carts and wagons, over 18 U.S. patents and counting. View all Pancake Wheel’s Youtube videos on fold flat carts, wagons, joggers here.